Porterhouse Steaks and T-Bones are often confused, due to the fact they are essentially the same cut of meat. A Porterhouse Steak is cut from the larger end of the short loin, but containing meat from both the tenderloin and the top loin. Because of the richness and tenderness of the cut, this is one of the best and most expensive steaks.In the earliest half of the 19th century, a ‘Porter House’ was a coach stop where travelers could dine on steak and ale. So in the U.S. around 1810, a porter house keeper in New York City began serving this fine steak, and it quickly gained widespread attention and popularity. 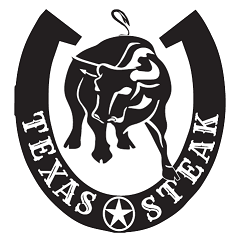 Texas Tip: It is widely known that one of Mark Twain’s favorite meals was pan fried porterhouse steak with mushrooms. See our recipe section for instructions on cooking this fine cut of beef. Nothing satisfies a really big steak appetite like an Omaha Steaks Porterhouse! It’s like having a whole Filet Mignon and a whole Strip Sirloin on your plate…all with the flavor-enhancing bone left in! The Talk Of The Town Combo pairs our fork-tender Filet Mignons with our king-size Porterhouse Steaks for a duo that’s sure to cause a stir. Imagine an entire bone-in Filet Mignon and an entire bone-in Strip Sirloin on your plate at once waiting to be savored, enjoyed and devoured. This is the definitive steak for the hearty appetite or perfect for sharing as a romantic dinner for two. When you’re looking for a grilling sensation, the Omaha Steaks T-Bone is a traditional favorite of serious steak fans. It’s a whole bone-in Strip Sirloin, plus a portion of tender Filet Mignon all in one generous cut. Carved from the center of the sirloin, our Top Sirloins are naturally lean and bursting with bold, beefy flavor. And because of the way our master steak cutters craft these steaks, they’re more tender than ever before! Can you ever get too much of a good thing? If you’re talking about Omaha Steaks T-Bones, we think not! So now you can enjoy even more of the true steak lover’s fantasy… an amazing 24 oz. T-Bone.